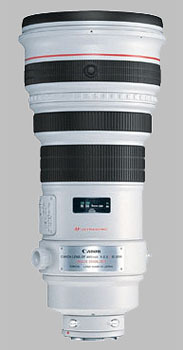 (From Canon lens literature) Super telephoto L-series lens with an Image Stabilizer for use in track and field sports as well as low-light nature and wildlife photography. The fluorite element and two UD-glass elements result in high resolution and high contrast. The ring USM and an improved AF drive algorithm make the AF speed the fastest in the world when used with the EOS-1v and EOS-3. This lens has the same AF stop and focus preset features as the EF 300mm f/2.8L IS USM. I haven't only used the 500L IS and the 600L IS but compared to _everything_ else in the line-up, the 400 2.8L IS (wide open) ties for Canon's #1 position for IQ alongside the 200 2L IS. The 400 2.8 shows very slight traces CA compared to the shorter 200 2 in near-undetectable quantities towards the edges. This is a great achievement since it's twice as long (and CA generally increases with focal length) but it's also a stop slower (slower lenses are easier to optimise for CA). I'm guessing the next iteration of this lens will improve the weight and have even better IQ. Colour - everyone notices you, but this can workin your favour when it comes to blagging your way into events! Awesome, I always wanted one, saved my pennies for a few years - was it worth the money & wait - YES YES YES. One sad thing I've noticed other camera users with poor lenses [100-400 zoom] for example slag off the weight of my lens - these saddo's ought to try one for themselves, their crap zoom would join plenty of others for sale on ebay - the IQ of this lens is so much better than any zoom lens on this planet. This lens is a beast almost 13 pounds. You will have to take the time to learn how to use this lens effectively. Once you master this lens it is stunning, yes, even at 2.8. Sharp, crisp, rich detail and color! There is a reason you see this lens at the sidelines of every major sporting event, it does not get any better at this length. Add a 2x extender and you have a pretty good 800. Beg, borrow, or rent one if you can, once you use one it tends to spoil you. Yes it is heavy, but so what? It is what it is, one of the finest lenses on the planet earth! while a touch soft at 2.8, it gets perfect from f4 up untill f16. the only annoyance with this lens (although it can be applied to all super-tele Ls) is the carbon fiber lens hood that can get broken very easy and it is really expensive to replace (500$ a piece). A monopod is mandatory, obviously.